Kaylee has a private violin studio in Traverse City. She has been teaching for more than 10 years and also teaches beginner to intermediate piano lessons. For more information on lesson availability and cost, please use the contact link in the sidebar. Each student is a unique human being with the potential to learn. Every student learns differently. All students will acquire skills at different speeds. Therefore, the way I approach teaching a student must be molded by his/her responses. Rapport is key in any student-teacher relationship. 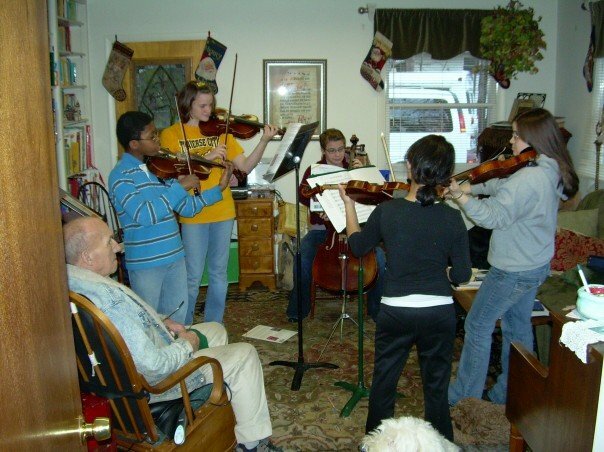 There is not a one-size-fits-all approach when learning an instrument or anything else. I incorporate elements of various methods that I have learned in the studio, in study, and in conversation with other professionals. The method used is not what is important; the student is what matters. My teaching style is individualized to meet each person where they are, but in order for it to be effective, the student must also contribute by regular practice and attendance to lessons. Learning and teaching is a two-way street.